Summer Start is a five-week program (July 5 – August 9) for new freshman with orientation from July 5 – July 7. Many of the next steps for Summer Start students are the same as students admitted to begin in the fall. Click on each step for additional detail about your next steps to enroll at Purdue for the 2019 Summer Start session. In addition, information is available on the Summer Start website. Attend an admitted student visit program. myPurdue is the online portal through which you will conduct business with the University now and once you are enrolled. Your portal provides a "new student task list" and indicates when you have completed the necessary steps to enroll. To gain access to your myPurdue portal, you must activate your online career account via the account activation website. You will need your Purdue University ID (PUID) number and your career account setup password, both of which were provided in your admission offer letter. Accept your admission offer no later than May 1 (or within 21 days for those admitted after April 10). A nonrefundable $400 deposit will be required to accept your offer. The deposit will be applied toward first-semester fees and the housing contract fee (if you contract with University Residences). File the 2019-20 Free Application for Federal Student Aid (FAFSA) to be considered for aid for Summer 2019, Fall 2019 and Spring 2020. You will be part of the Summer Start Learning Community and are required to live on campus for the Summer Start session as well as for the fall and spring terms of your first year. The housing contract deadline is May 5. Visit the Summer Start housing website to learn more. Prior to course registration, you will be required to demonstrate your ability to succeed in math. SAT and ACT math scores as well as Purdue's ALEKS math assessment are among the resources your academic advisor can use to determine whether you are academically prepared to succeed in the first math course required for your major's plan of study. The Math Department website provides information about the ACT, SAT or ALEKS scores necessary for placement in various math courses. You may refer to the University Catalog to find your major's plan of study. If your ACT or SAT math score is not high enough for placement in your required math course, you may take the free, online ALEKS assessment (accessible via myPurdue prior to your registration period). Alternatively, you may take a Purdue math course for which your ACT or SAT score qualifies you and that serves as a prerequisite for your required math course. Fee statements will be sent to your @purdue.edu email address and accessible through myPurdue. Summer Transition, Advising and Registration (STAR) is the required summer registration program for new students. As a Summer Start student, you should attend STAR on Monday, June 10, 2019. Boiler Gold Rush is the new student orientation program held the week before fall classes begin in August. 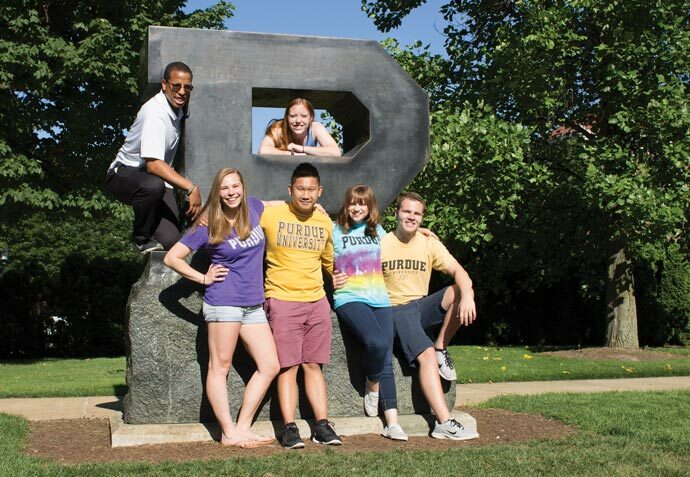 Summer Start ends the Friday before BGR begins and Summer Start students are able to attend along with their peers who will be beginning at Purdue during the fall semester. BGR registration is available via myPurdue, to students who have accepted their offer of admission. Purdue requires final grades from any coursework completed prior to enrollment, and it is your responsibility to ensure we receive official, final transcripts. Final high school transcripts must include confirmation of graduation. Also, if you provided self-reported ACT or SAT test scores on your admission application, you must provide official scores from the testing agencies. Keep in mind that all admission offers are conditional, based upon the expectation that students will maintain the academic and personal conduct standards upon which they were admitted. The University reserves the right to rescind an admission offer if an individual's circumstances warrant. Get connected and be involved. Find out what's going on at Purdue via BoilerLink. View the academic calendar.